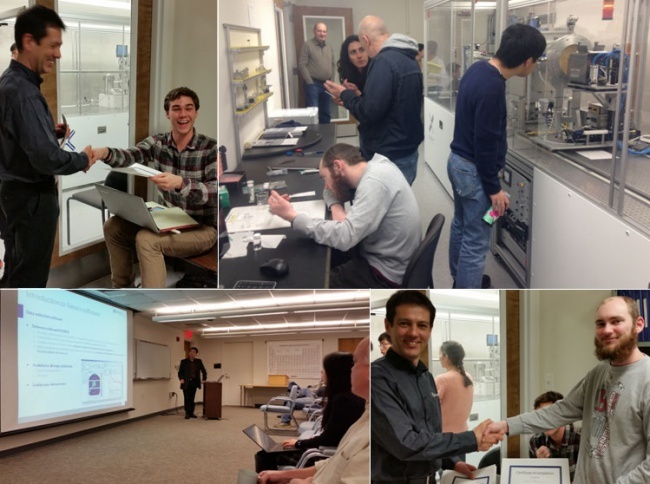 The workshop was held on the 19th and 20th of March at the University of Maryland X-ray Crystallographic Center in College Park, Maryland, and focused on the application and operation of the Xeuss SAXS/WAXS/GISAXS system, a key instrument for serving research faculty, principal investigators and industry, in the scope of their research into nanoscale analysis. Dedicated to the actual and potential users of the Xeuss system in the DC area, the event was designed to introduce and educate users on the wide range of capabilities of the Xeuss. More than 25 students from the University of Maryland, College Park, NIST, and George Mason University attended the workshop. Dr. Pierre Panine, Xenocs Senior Scientist, presented and discussed theory and state-of-the art research examples with the attendees as a group before dividing up into smaller groups for three ½ day hands-on practical sessions. During these sessions, polymer thin films, diluted proteins and surfactants solutions, synthetic fibers and gel networks were all measured and analyzed successfully using transmission and Grazing Incidence SAXS. The event was very interactive and positive feedback was expressed during the whole event about both the lectures and practical sessions. For more information please refer to the University of Maryland X-ray Crystallographic Center website. Contact : Peter Y. Zavalij (pzavalij@umd.edu).